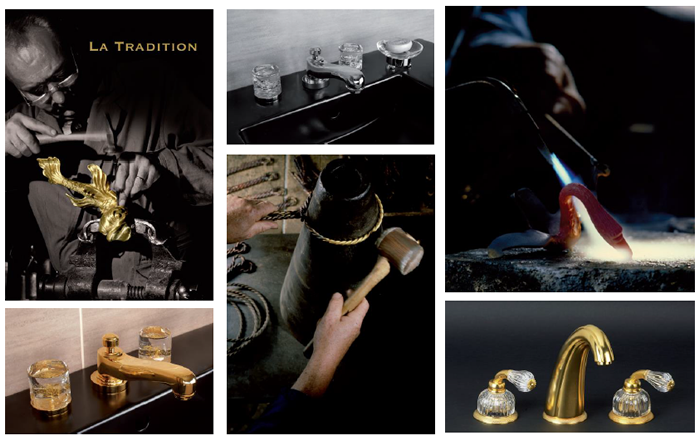 Founded in 1937 by a Parisian antique dealer, Crystal and Bronze manufactures its taps and bathroom accessories in the purest tradition of expertise in French, in the medieval village of Château-Landon. Cristal et Bronze is a French manufacturer that has retained its expertise in workshops located near Paris, in the medieval village of Chateau Landon.The architects and interior designers from five continents rely on the world of Bronze and Crystal, both for traditional collections to more contemporary styles. These workshops have been able to modernize over the decades Crystal and Bronze team today finest projects in the world, the book in a few weeks, and adapts to the technical and environmental highest standards.